St-Gervais-et-St-Protais Church of Paris is located in the 4th arrondissement of Paris, on Place Saint-Gervais in the Marais district, east of City Hall (Hôtel de Ville). Beginning in 1653, the church employed and sheltered the Couperin family, one of the most famous dynasties of French musicians, for more than two centuries. On one side of the church, the home of the famous harpsichordists, organists, and composers still stands, with a plaque commemorating the Couperins' tenure in this place. 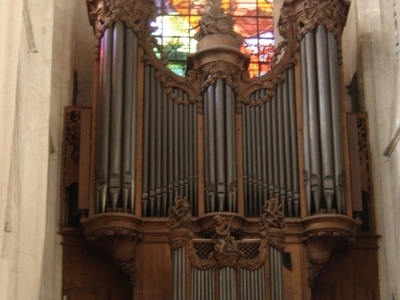 The organ used by Louis and François Couperin still exists today inside the church. 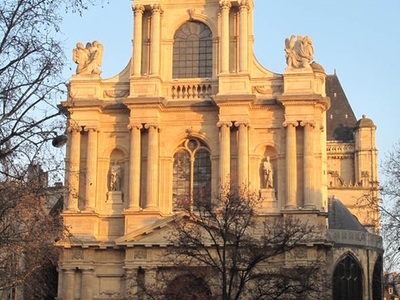 Built by the most famous organ builders of the time - François-Henri Clicquot, Louis-Alexandre Clicquot, and Robert Clicquot - it is a fine example of the French baroque style. Here's the our members favorite photos of "Churches near Centre Pompidou District 04". Upload your photo of St-Gervais-Et-St-Protais Church!